Family Practitioner Julie Steinhauser, M.D., of Lincoln, Neb., will begin practicing at Cuyuna Regional Medical Center’s Crosby Clinic on July 18. She has special interests in pediatrics, newborn care, women’s health, and procedures. 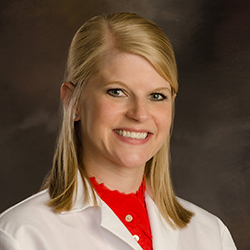 Dr. Steinhauser earned her Medical Degree at the University of Nebraska Medical Center College of Medicine where she also completed her Family Medicine Residency in 2015. She received her Bachelor of Science degree in Biopsychology with high distinction from Nebraska Wesleyan University. A member of the American Academy of Family Physicians and the American Medical Association, Dr. Steinhauser practiced at a clinic in Lincoln the past year. She and her husband, Scott, have two daughters: Irene and Vivian. In her free time, she enjoys spending time with family, playing golf and tennis. For an appointment with Dr. Steinhauser, call 218-546-7462.